Today, Microsoft announced that a Machinima app is going to be available for download the same day as the Xbox One launch. The app will give you helpful guides, video content, and the option to read a review before purchasing a game! What's really neat is that you can use the Xbox One's Snap feature to run the Machinima app simultaneously. This will give you content based on the game you are currently playing! The "Machinima Wingman" will walk you through strategies or tutorials (with commentary) for your current game. These videos can be watched while you play, or watched in fullscreen after the user has paused their game. 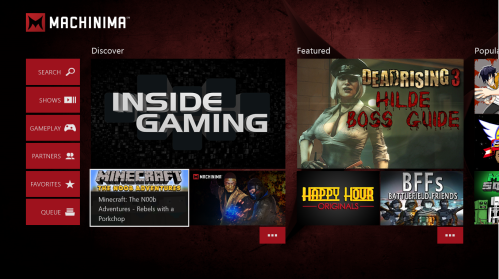 "This new and improved Machinima app will take advantage of the Xbox One platform capabilities to give gamers an unparalleled experience they can’t get anywhere else. With our Xbox 360 experience ranking as one of the most popular and highest performing apps on the platform, we are really excited about delivering even more compelling experiences with Xbox One," reads the post. Along with the Snap feature, you can use the Machinima app with Xbox’s SmartGlass. This will give you a second screen that you can solely dedicate to your Machinima Wingman. The Xbox One is set for launch on November 22nd. If you would like to read more or keep up to date, you can do so Here.